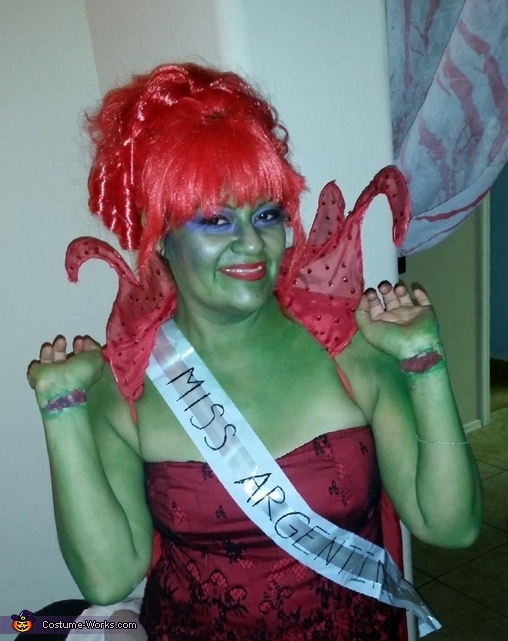 This homemade costume for women entered our 2014 Halloween Costume Contest. I've always been a huge beetlejuice fan and Miss Argentina was always my most favorite character. Even though she has such a tiny part in the movie I always loved how she could be pretty even as a dead person! Lol! So I knew I knew I would have to make her costume because they don't sell it as a costume. The whole outfit actually came out of my closet luckily! The only things I had to buy were the wig, cape and sash. The cape was created out of a fabric I found at the thrift store. I was able to make it stand up with that wire used for fake flowers found at the dollar store. I then glued some rhinestones to it. The sash was just some wedding type of ribbon used to make a giant bow for gifts also found at the dollar store. The wig was probably the hardest part of the costume! I couldn't find one similar so I finally gave up and just bought me any ol red wig with bangs! It was a rockerish wig so I had to fix up the bangs and pin it up and added a curly hair piece from the dollar store to it to add the curls she has in her hair. It took me hrs to do and was about to give up when it finally just came together!! The scars were made with some latex stuff and added a little fake blood to it. And lastly the green makeup was MAC so it wasn't cheap halloween makeup. It felt very light and stayed on the whole entire night with no retouches!